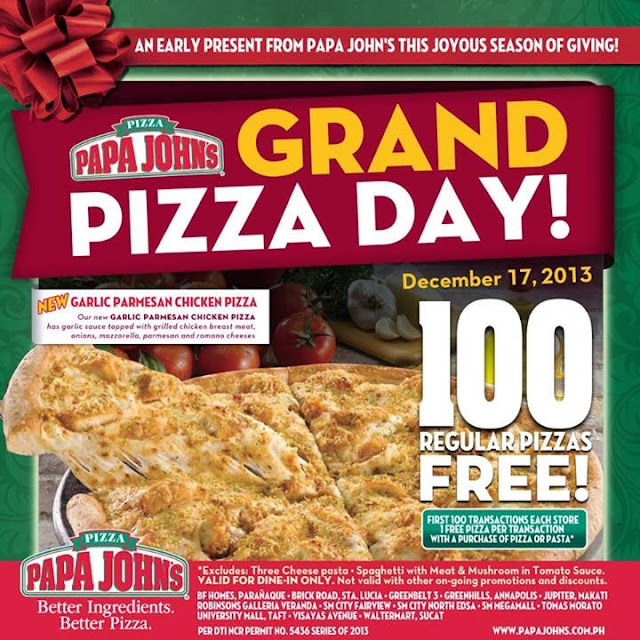 [i am a dekaphobic]: Papa John's Grand Pizza Day on December 17! For the demo, we were shown how their bestselling pizza, the Super Papa, is made. The Super Papa has pepperoni, Italian sausage, ham, mushrooms, onions, green bell peppers and black olives. We also got to try two new pizza flavors: Garlic Parmesan Chicken Pizza and Tuscan Six-Cheese Pizza. Garlic Parmesan Chicken Pizza has garlic sauce topped with grilled chicken breast meat, onions, mozzarella, parmesan and romano cheeses. Hot Salad, Papa John's version for the cold macaroni salad. Crabmeat Pasta, a creamy dish with crabmeat strips. We also had this delicious dessert, the Choco Magma. Robinsons Galleria Veranda, University Mall Taft Avenue, Greenhills, Brick Road, Sta. Lucia Mall, Tomas Morato, BF Homes Paranaque, SM Fairview, SM Megamall, SM North EDSA, Greenbelt 3, Waltermart Sucat, and Jupiter St. Makati Ave., and at the new branches in BlueBay Mall of Asia and Ever Gotesco Mall Recto. Thanks to Papa John's Philippines for having us. There is a Papa John branch in Jupiter, but I've never really given it a try. Now I wonder if I could make time to enjoy their pizza day promo. I'd love to get my hand in those garlic parmesan chicken pizza, looks yummy.